At the heart of it, we stand before Place de la Concorde. Painted in 1876, Edgar Degas’ portrait shows his friend, French painter Ludovic-Napoléon Lepic, Lepic’s young daughters and his wolfhound mid-stride across the dusty Paris place, with the low Tuileries Gardens wall behind them. A breakthrough in modern compositional cropping and negative space, Degas had taken note of the snapshot qualities that were being captured that same year on film emulsions by early pioneers in photography. 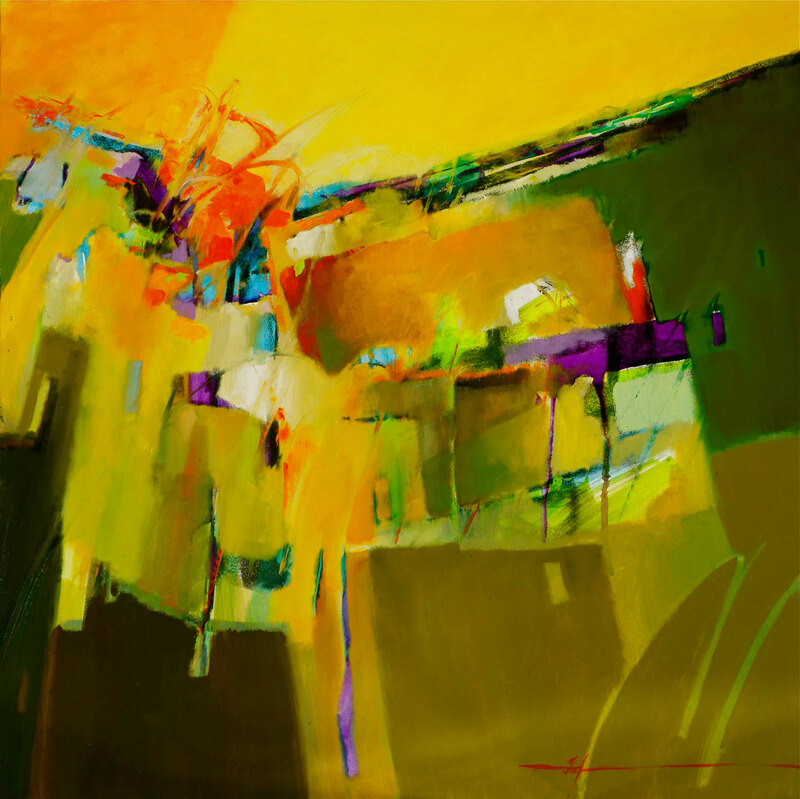 His mise-en-scene, all restraint of design, hints at the embryos of modernism, graphics, abstraction and colourfield in one virtuosic, golden ochre colourblock. A brushy rendering of Lepic and his companions floats in warm and cool greys, the whole thing held together by Lepic’s velvety top hat. Sara at the Hermitage in front of Degas’ “Place de la Concorde.” According to Simon de Pury, the back is affixed with a label with the Gerstenberg address in Berlin. Place de la Concorde’s recorded provenance begins with German art collector Otto Gerstenberg, an actuary-turned-magnate who nationalized life insurance in Germany in 1892. With his fortune he began collecting the drawings of Dürer and Rembrandt, then moved to Constable and Reynolds, then Delacroix, Géricault and the Barbizons. Gerstenberg bought 30 Daumiers and 10 Corots, got feverish on the portraits of Monet, Manet and Renoir before committing to landscapes: Sisley, then more Monet. In 1911, he bought Place de la Concorde for a hefty 120,000 francs. When Gerstenberg died in 1935, he left his collection to his daughter, Margarete Scharf. 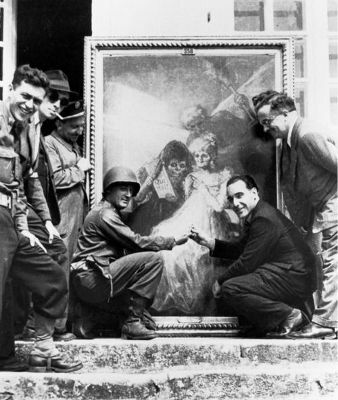 At the outbreak of the war, Margarete asked the Berlin National Gallery to take the artworks for safekeeping. 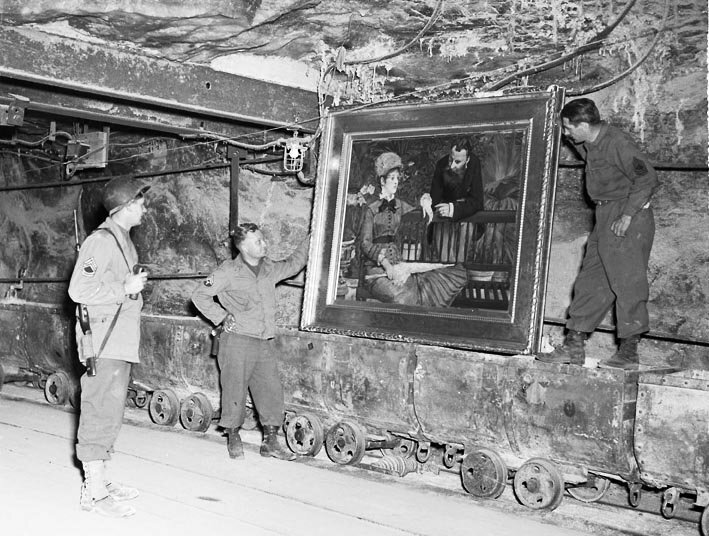 In 1945, the Red Army took a special bunker under what was once the Berlin Zoo and the paintings hidden there were crated up and sent by train to secret depositories at the Hermitage and the Pushkin Museum in Moscow. 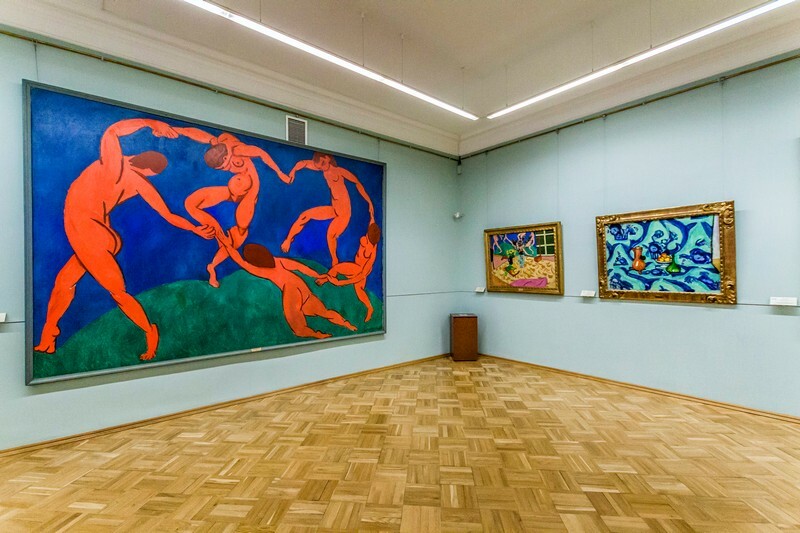 The seizure was part of what Germany claims are more than 2 million art objects (including 200,000 paintings) taken by the Soviet Trophies Commission as retribution for the Nazi pillage of hundreds of thousands of artworks from Soviet territories during the war. While the Soviets had returned 1.5 million of the artworks to their ally East Germany by 1958, the “leftovers,” what the Hermitage says it kept for “cleaning and restoration” or had been lost in the bowels of the Pushkin, have been trickling out of storage since the dissolution of the Soviet Union. Some newly unveiled works have turned out to be fakes, while others seemed to have quietly come from mysterious private collections. Dieter and Walter Scharf, Margarete’s sons, have been to see their family pictures here, including Place de la Concorde. Like many, many other victims of plunder, they were relieved to find their treasures intact and remain embroiled in their future destiny. Esoterica: Failed artist Adolf Hitler had been denied entrance to the Vienna Academy of Fine Arts in both 1907 and 1908. In 1933 as Chancellor of Germany, in an effort to clean up the national aesthetic, Hitler purged the state museums of cubism and other work he called degenerate garbage and set to establish what would be a super museum of Nazi treasures in Linz. Military units called Kunstschutz stole, confiscated or forced the sale of gold, silver, currency, books, sculpture, decorative art, ceramics, religious objects and paintings from private collections and museums in the name of preserving for safekeeping the cultural heritage of German enemies. Hitler and his dignitaries personally amassed hoards. In 1945, a recovery effort led by the Allied Forces’ Monuments, Fine Arts, and Archives Program set out to return missing works to their owners, families and countries, while the Red Army took what they felt was equal compensation, then returned much of it to its East German allies. Many pieces remain lost. Russia has yet to make a full public accounting of the contents of its museums. Hi Sara. Thanks for this letter! Such an interesting history. Degas’ painting “Place de la Concorde” is wonderful. I have long admired the French Impressionists. It must have been wonderful to go to the Hermitage and see the collection of paintings they have there. I was able to go to the Barnes Museum in Merion, Pennsylvania and see Albert Barnes awesome collection of Impressionist, and Post Impressionist paintings a few years back, now. It was an experience I cherish. It was thrilling to see so many French Impressionist paintings, together in a beautiful building Barnes had designed, to be a gallery for these paintings. They have since moved the Barnes Collection to a new building in Philadelphia, PA, nearby the Philadelphia Museum of Art, which is a gorgeous building! Thanks, again. 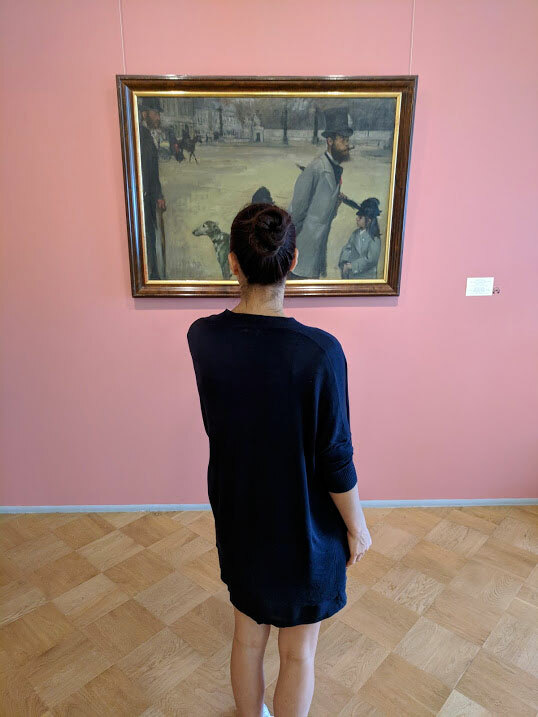 Would be nice to see the Degas painting rather than Sara’s head. If you want to see the painting, it’s very easy to find it yourself, within seconds. I love that the photo includes Sara. Thanks so much for this story! I like that photograph! It shows the experience of being at a museum or art gallery. That one snapshot tells a story! I like it. Then, if you want to see the whole painting, which Sara described beautifully, in her letter, you can go online, or elsewhere to see it. That’s just my perspective. I absolutely agree; I think it is a wonderful photo! I always enjoy seeing the author in anything she so generously posts. Thank you, Sara, A great photo and a wonderful letter. I read all of yours and enjoy them so much. I have never responded before, but I feel you need so much respect and so many ‘thank you’s’ for what you are doing. I am surprised someone would criticize anything you write or show. Keep up the great work! In 2000 I travelled to St Petersburg with my husband and two teenaged children. We spent 5 days in the city. We were finishing our second full day at The Hermitage and asked our 12 yo son and 16 yo daughter where they would like to go the next day. They both asked to come back a third day to continue to explore this impressive museum and we still talk about the ‘Hidden Treasures’ impressionist paintings exhibit which was a highlight. 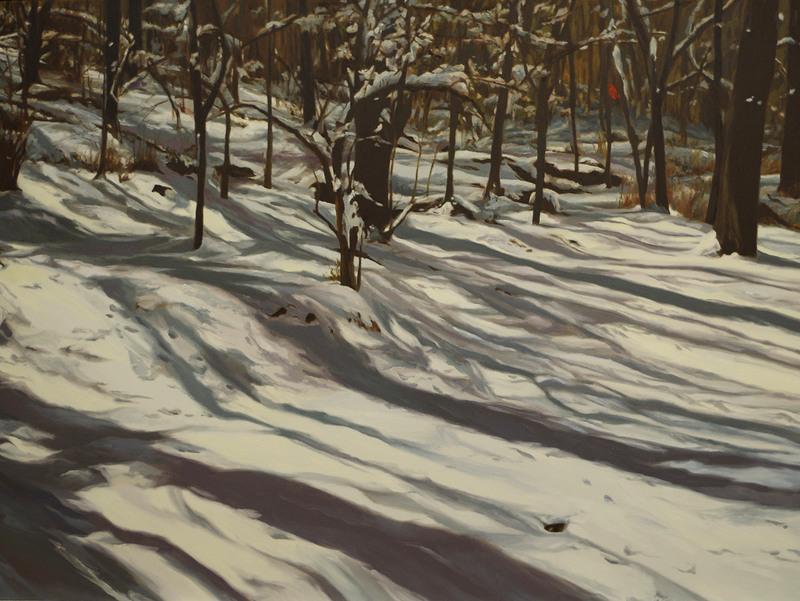 I remember being told that some of these paintings were considered type specimens for paint colours because they had received so little exposure to natural light. Great article. So sad that there are always excuses to keep other peoples’ property, especially after wars and other major conflicts. A morally repugnant stance made even more repugnant because it could be so easily resolved. I hope the victims of this “preservation of artistic treasures” receive their property back someday soon. The Soviets seem to have “collected” in the same way Adolf Hitler and Hermann Goering did… Mind you I’d give Greece their marbles back so what do I know.